A powerful reappraisal of the role of cities and their inhabitants in solving global problems, from a leading expert in urban development.In the second half of the twentieth century, revolutions reshaped our worldthe civil rights movement in America, the fall of the shah in Iran, the collapse of the Soviet bloc, and the end of apartheid in South Africa. All of these revolutions were fundamentally urban. They were the revolutions of Detroit, Gdansk, Berlin, Tehran, and Johannesburg, uprisings of city dwellers intent on ending their marginalization and securing their place in the world economy.InWelcome to the Urban Revolution, internationally recognized urbanist Jeb Brugmann draws on two decades of fieldwork and research to show how the city is now a medium for revolutionary change. Not just political upheaval but technological, economic, and social innovations are forged in our cities. We may think of cities as hotbeds of crime or engines of globalization, but Brugmann shows how cities are becoming laboratories for solving major challenges of the twenty-first century: poverty, inequality, and environmental sustainability.Bridging urban studies, economics, and sociology, Brugmann gives us a new way of looking at cities, giving shape to the emerging practice of urbanism. His positive, unconventional analysis turns traditional ideas about the city on their head. 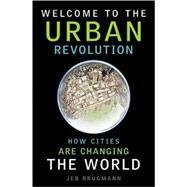 Jeb Brugmann has been instrumental in urban development in 49 cities in 21 countries in his two decades of work on urbanization. His work over the years has been officially recognized by the United Nations General Assembly, three UN Summits and the UN Climate Secretariat (Kyoto Protocol). He has received numerous awards and government funding from twelve different countries, and is a faculty member of the Cambridge University Business and Environment Program. He lives in Toronto with his wife and children.